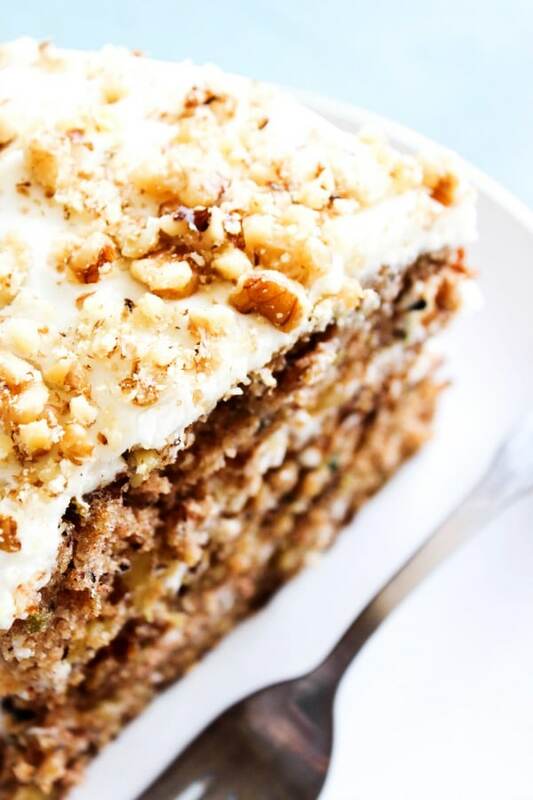 Insanely delicious this BANANA ZUCCHINI CAKE with mouthwatering layers of cream cheese frosting and walnuts; it is one of our family’s favorite cakes. I love cake, if you didn’t already know that, well now you do. This BANANA ZUCCHINI CAKES is something that I love to make all year long to feed my urge to splurge. 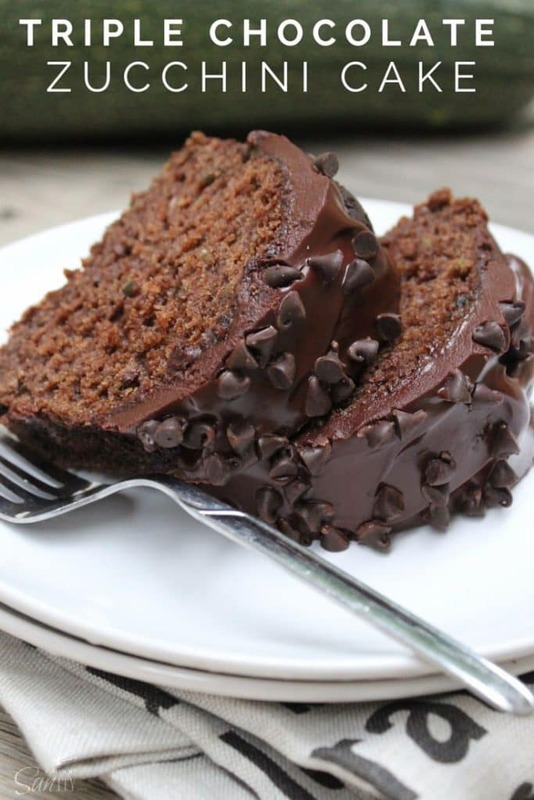 With that said, since this cake has zucchini and bananas in it – I feel a whole lot less guilty devouring a slice or 3. I also love zucchini, and this past fall I had a plethora of zucchini thanks to my friend Erin, over at Dinner, Dishes and Dessert. I pretty much incorporated zucchini into everything. 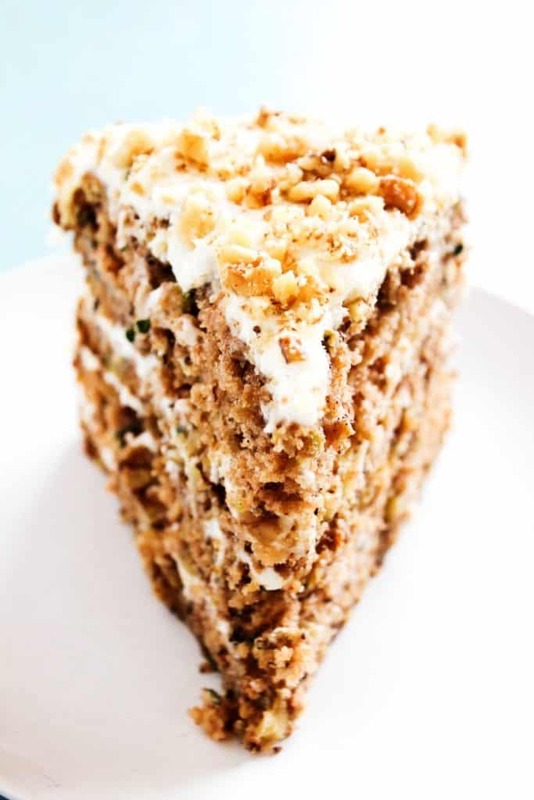 A month of so ago, I made this Pumpkin Zucchini Cake and while we all loved it my husband said that he would have loved the addition of walnuts. I informed his that walnuts would go well with a Banana Zucchini Cake, not a Pumpkin Zucchini Cake. Therefore that conversation sparked this recipe. The funny thing about this whole cake, is that I made it for a special occasion but when our guest arrived we went with hot fudge so I just left this cake in the refrigerator and my kids and hubby were just chopping at the bit to eat it. But I made them wait an entire two days for when we had some family coming into town and I didn’t want to have to make another dessert. Make sure to grease your pans well to allow the cakes to remove from the pan easily. I love to line the bottom of the pan with parchment paper, allowing for a beautiful, stackable cake. Be sure to allow the cake to completely cool before frosting and stacking the layers. Chop up your walnuts. This makes it easier for the walnuts to stick to the frosting. Use freshly grated zucchini for best results. Once we did get to eat it, everyone was oohing and awing. And it was hard to keep my hubby away from the cream cheese ice with walnuts. So it was a big winner. And this is easily my favorite cake, which is big of me to say since I am a HUGE, HUGE chocolate lover. My son, Madden took a slice of leftover cake to his teacher, Mrs. Cawley the next day and when I saw her a few days later she was raving about it. How do you make Banana Zucchini Cake? Prepare 2 9-inch round cake pans by spraying with cooking oil and line the bottom with parchment paper. Combine all ingredients for cake in order as listed above, beat on medium-high until well combined. Bake for 20-25 minutes or until toothpick inserted in center comes out clean. Remove from oven and cool on baking rack. Once cake is completely cool make cream cheese frosting. Beat together cream cheese and melted butter until smooth and there are no cream cheese chunks. Add in powder sugar and cream together by beating on medium-high. Add in milk one tablespoon at a time, until you get your desired consistency, if you want to make the frosting a little runnier, like pictured add al 4 tablespoons. Cut each round cake in half. Place one layer on a cake plate or the serving plate you will be using. Add ¾ cup frosting and 1/3 cup chopped walnuts, then add another cake layer. Repeat with remaining cake, frosting and walnuts. After the last cake layer add the remaining frosting and walnuts. I just poured mine in the center and then using a knife gently pushed it from the center out and let it run naturally down the sides of the cake. 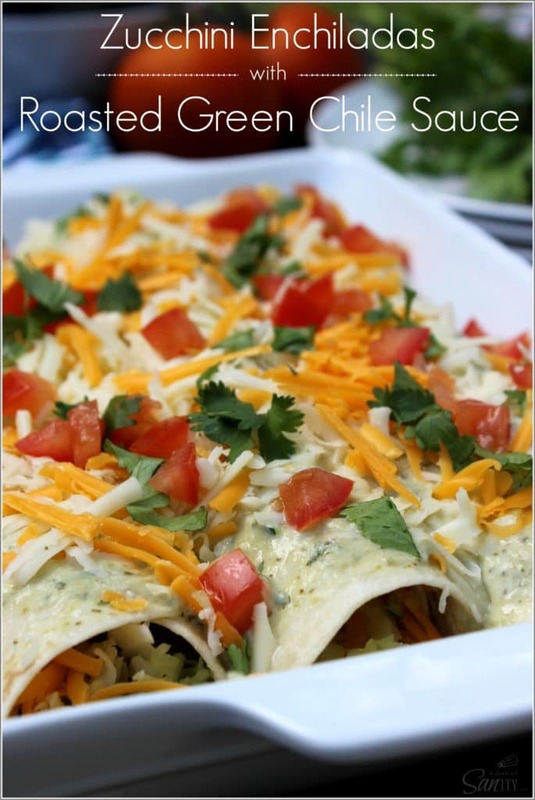 Refrigerate for 30 minutes or until ready to serve. My favorite kitchen items I used to make this recipe for BANANA ZUCCHINI CAKE. 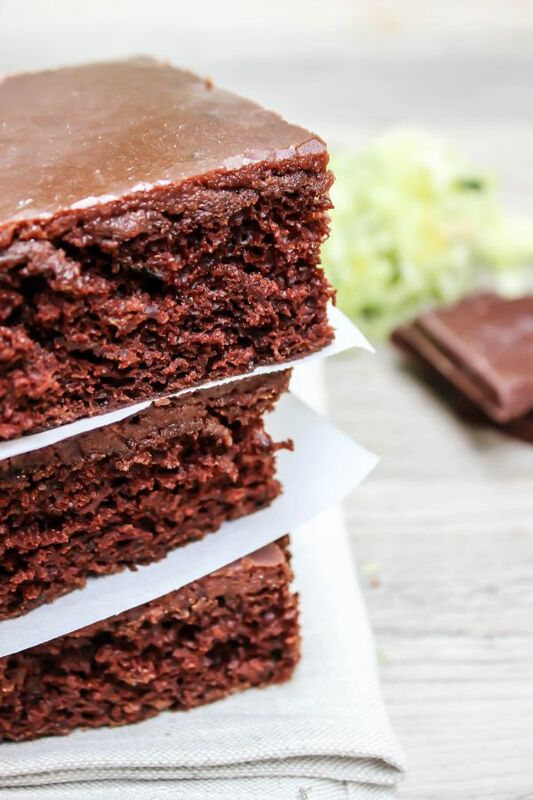 Check out a few items that will make this recipe easier: cake pans and a spatula. 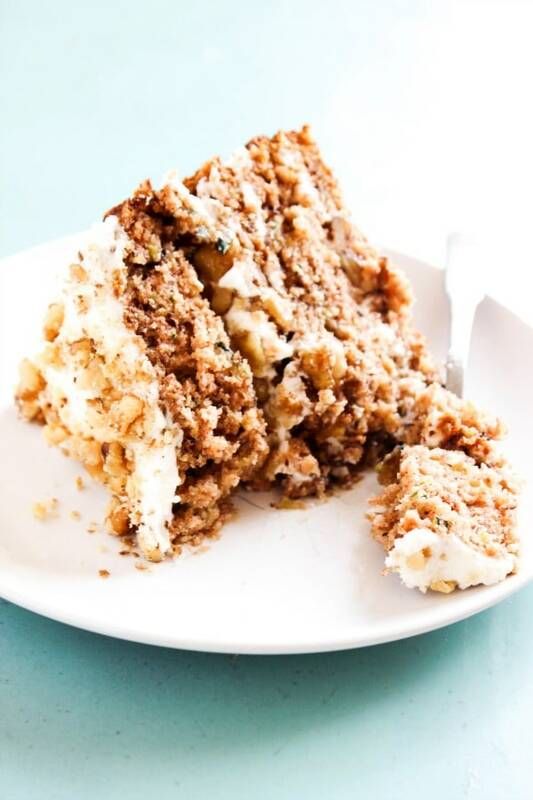 Don’t forget to pin this recipe for BANANA ZUCCHINI CAKE to your favorite Pinterest board for later. 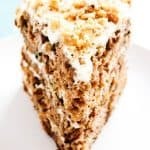 Insanely delicious this BANANA ZUCCHINI CAKE with mouthwatering layers of cream cheese frosting and walnuts; it is one of our family's favorite cakes. Prepare 2 9-inch round cake pans by spraying with cooking oil and line the bottom with parchment paper. Set aside. Beat together cream cheese and melted butter until smooth and there are no cream cheese chunks. Add in powder sugar and cream together by beating on medium-high. Add in milk one tablespoon at a time, until you get your desired consistency, if you want to make the frosting a little runnier, like pictured add al 4 tablespoons. Cut each round cake in half. Place one layer on a cake plate or the serving plate you will be using. Add ¾ cup frosting and 1/3 cup chopped walnuts, then add another cake layer. Repeat with remaining cake, frosting and walnuts. After the last cake layer add the remaining frosting and walnuts. I just poured mine in the center and then using a knife gently pushed it from the center out and let it run naturally down the sides of the cake. Sprinkle with remaining walnuts. Refrigerate for 30 minutes or until ready to serve. Recipe adapted from Pumpkin Zucchini Cake. Total time does not include the time to cool. Love zucchini? Here are some other ideas to incorporate this fall favorite. Such a pretty cake and just in time to use up the last of this summer’s zucchini from the garden! I love zucchini and walnuts! Such a fantastic Spring cake!! This looks crazy delicious – can’t wait to give this one a try! That looks scrumptious, I want a big slice of it! This is the stuff dreams are made of! This looks so tender and delicious!! I’m always looking for new cake recipes to try!